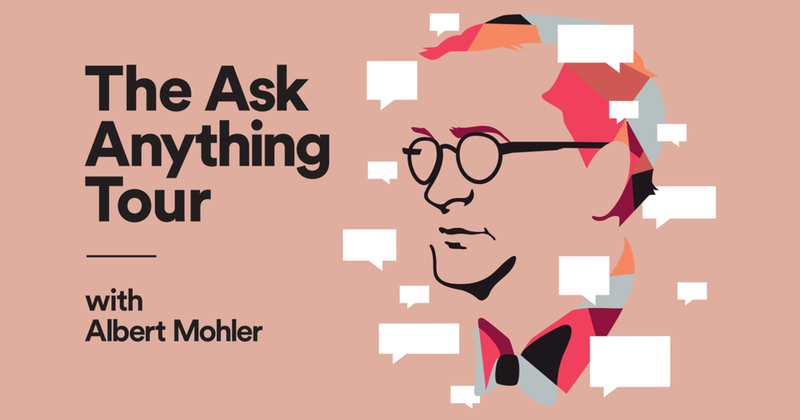 This Friday, we will have the privilege to attend the Ask Anything Tour at USC, hosted by Ligonier Ministries. Dr. Albert Mohler, a world-class prolific author, radio host, TV guest (ABC, NBC, CNN, FOX), newspaper contributor (Washington Post, USA Today, Wall St. Journal), social commentator, theologian, seminary president, and Ligonier Teaching Fellow will be inviting non–church going students, skeptics, and atheists to literally ask anything pertaining to life, faith, Christianity, culture, etc. It will be a profound time. This is not an event churches are invited to. It is an event for the skeptic and unbeliever. However, TD has been granted permission to attend. Please let your leader know IMMEDIATELY if you’ll be able to attend. We will meet at church at 6 p.m. and will return by 10:30 p.m. If you are not going with us, there will be no TD meeting at church. TD has also been granted permission to attend Truth and Consequences, a training event to help equip Christian college students to defend the claims of Christ, to explain to unbelievers that Jesus is the way of salvation, and how to know Him more fully. Trainers will be Drs. Albert Mohler, Stephen Nichols, and Burk Parsons. This event is already sold out. However, we have secured a limited number of seats for TD. If you want to go, please let your small group leader know ASAP! We will meet at the Hsiehs’ home at 8:15 a.m. and return by 1 p.m.
TD Sat. – Serve Our Society (SOS) Saturday! We have a great opportunity to build on Love One Another Night by befriending and hanging out with some wonderful elderly friends this Saturday. It’ll be a feel-good time of encouragement, doing what’s right, perspective, and fun. The residents at the Care Center are so special and rich in heart, you’re sure to be blessed. Meet at the Hsiehs’ at 9:30 a.m. You’ll return to the Hsiehs’ by around noon, where we will have lunch together (or you can go home). Let your small group leader know if you can make it! Kathy shared this poignant and meaningful piece with TD’s leadership after Love One Another Night. We’d like to share it with you as well, in hopes it will both broaden and deepen your understanding of life. I once felt accomplished, serving others rather than needing to be served. I brought meals to people in need but now I can’t even make my own coffee, and sometimes my husband even helps me lift my cup. When Joel is out of town, someone needs to stay with me because I can no longer stay alone. Nothing seems easy anymore, and I look back on my days of independence with longing. At times, I feel I have little to offer. I know in my head that usefulness isn’t what the Christian life is all about. God doesn’t need me, and I am not indispensable in the kingdom- none of us are. God delights in us, not because of anything we bring or do, but simply because we are his beloved children. Additionally, usefulness isn’t for us to measure; God often uses us in ways that we never see or know. This life is not about our glory – the impact we make on this world – but about God’s glory. His grace is sufficient for us and his power is made perfect in our weakness. So when we look weak, we really are strong (2 Cor 12:9, 10b). The dying dandelion, which is embedded in my logo and on my website, reminds me of strength from seeming weakness. While dandelions are unwelcome on my lawn, their beauty at the end of their lives has captivated me. In its heyday, the dandelion is bright and rugged. It grows in harsh conditions, often in places where no one sees or knows but God. Some people see it as unstoppable, its bright yellow petals visible from a distance. But as it is dying, being stripped of its strength, the dandelion is often hard to see. It has given everything and there seems to be nothing left; the vibrant color that once defined it is gone. In this stage, it is preparing to reproduce, doing its most glorious work. Sometimes, like the dandelion, we feel we are most useful to God when we are sunny, strong and resilient. People notice us. But when our health changes and we feel delicate and dependent, we wonder what good our lives are. And society reinforces that doubt by ignoring the elderly, encouraging euthanasia, shunning the disabled, aborting the unwanted. It seems as though we must prove our usefulness for society to value us. And when we can’t, we may feel like a burden to others, wishing we could be more productive. But when does the dandelion do its most important work? When it’s dying. When the fragile seeds are blown away by the wind. When it’s surrendered itself and is sowing seeds of new life. And the stronger the wind blows, the farther the seeds will go – to places that the lone flower could have never gone itself. In John 12:24, Jesus says, “Truly, truly, I say to you, unless a grain of wheat falls into the earth and dies, it remains alone; but if it dies, it bears much fruit.” A grain of wheat may be useful and majestic when it stands tall and alone, but it doesn’t reproduce or bear fruit then. Its influence is only multiplied when it falls into the ground and dies. When it’s bruised and buried and the external kernel rots away underground, carrying the seeds of new life. When we die, whether it be physical death or the death of our dreams or dying to ourselves, something remarkable happens. God brings new life. No one looks forward to dying. Or being stripped bare. Or feeling useless. Most people say they want to die in their sleep when they are capable and healthy; they don’t want to face the ravages of aging and disability. But watching others trust God as they struggle with debilitating frailties is sacred. It inspires me in my own struggles. I know that God will be sufficient for me just as he has been sufficient for them. Their stalk may be bare, but it stands firm. And those people are a marvel to me. I have the privilege of being in a Pain Pal group with friends who are enduring unspeakable physical suffering. Many of them have caregivers because they cannot care for themselves. Yet their radiance is profound; they speak of an intimacy and joy in Christ that carries them through the worst pain imaginable. They are my heroes. Their willingness to praise God and encourage others amid their own struggles has changed me. Struggles like stabbing, mind-numbing relentless pain, waking up constantly through the night in agony (if they sleep at all), quadriplegia, multiple amputations, lying in bed in a dark room all day unable to do anything. Compared to most of them, I know nothing of suffering. And yet they constantly reassure me that my pain matters – all our pain matters. These friends remind me of the dandelion. They are completely yielded to God and their lives are a testimony of his grace. They may feel they can do nothing but lie in bed and pray, but they are bearing more fruit than most do in a lifetime of serving. Their influence is greater than they can imagine, and the wind is carrying their witness to faraway places. It’s being carried by God who is using it for his glory. Measure thy life by loss and not by gain; not by the wine drunk but by the wine poured forth, for love’s strength standeth in love’s sacrifice, and he that suffereth most hath most to give. But not only is it cute, it’s educational, as Kathy reads the story of Brother Andrew, who faithfully fulfilled his calling by courageously bringing Bibles to people in closed countries. This Friday, we will put the “love one another” mandate into practice as each small group will be reaching out to and ministering to someone or some family from church. We’ve heard the teaching, we’ve discussed it, and not we live it out. Please check with your small group leaders for the time and place to meet. Go in the love and name of our Lord, and give it all you’ve got! We’re looking forward to a great time of discussion this Friday in our small groups. We will be meeting at church at the regular time for a time of fun, musical worship, and small groups, led by student discussion leaders! Click “How We Are Supposed to Love” mp3 and Table of Contents to review and prepare for our small groups this Friday! This Friday, the desire is to work out, discuss, fine tune, and work through the specific teaching, passages, commands, etc. that were brought forth last Friday – not for discussion’s sake, but for action’s sake, for implementation’s sake. We need to ensure that we plan for the following week’s night of action. Ideally, we want all TD’ers to begin developing a lifestyle of loving God and loving our neighbors, and to actively make loving/serving others a regular given in our lives. The last portion of this night will be planning/prepping for “Love One Another” Night. The teaching is about loving “one another,” and as I taught, one of the greatest testimonies is loving the “one anothers” that are harder to love or who we naturally wouldn’t love and spend time with. So, before we go to the outside world, let’s follow Jesus’ game plan and love some of the “one anothers” outside our natural sphere; and in doing so, hopefully, TD’ers will get closer to one another in the process. “When the Son of Man comes in his glory, and all the angels with him, he will sit on his glorious throne. 32All the nations will be gathered before him, and he will separate the people one from another as a shepherd separates the sheep from the goats. 33He will put the sheep on his right and the goats on his left. Any community is only as strong as it takes care of the weak. Friday, we heard how God wants us to live and we were challenged to “get on the court and take the shot.” Building on last month’s foundational study of what love is, this month, we take the next step and look at what He wants us to do with His love. Later in the month, we’ll attempt to live it out. Before we do, it’s important that you know well “How We Are Supposed to Live.” We’ll work through God’s commands for us in our small groups this Friday. If you weren’t at TD last Friday, or need to review the message, listen and take notes on the message below before we meet this Friday. 0:54 – 4:20 What is our place in His story?